We headed back to Wilmington after our visit to Norfolk, arriving a day before my Mom’s Red Red Wine Birthday bash, a themed event based around the song of that name. 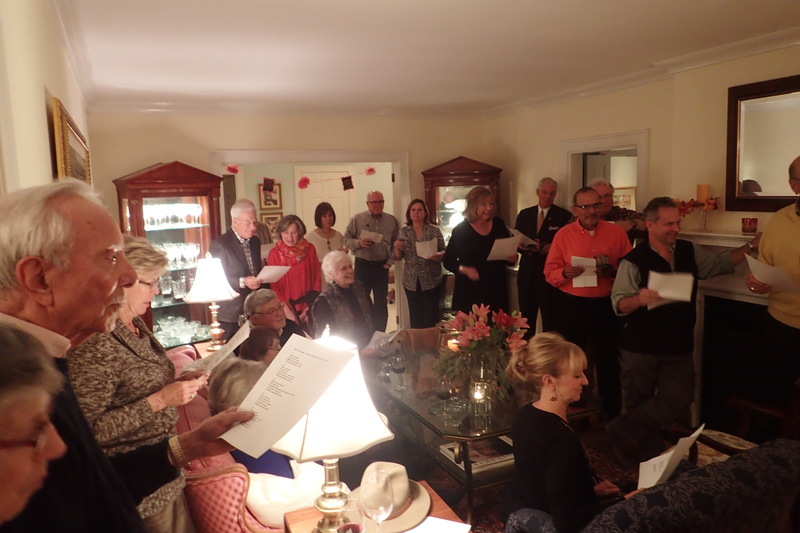 A couple dozen of Mom and Tim’s local friends attended what turned out to be a fantastic party. In the days leading up to it Tim had recorded a background track of the UB40 version of Red Red Wine and sent out modified lyrics to all attendees. With a properly positioned microphone he recorded the entire group singing it through two takes, preserving what is no doubt a musical masterpiece. Suitably lubricated by drink and fine food, a handful of the party goers lingered long after, enthusiastically performing a variety of hits, accompanied by Tim’s guitar and assisted by a couple of us furiously pulling up lyrics on smart phones to get everyone beyond the first verse and chorus. The next day was not the usual after party downtime, we had a Thanksgiving feast to prep. 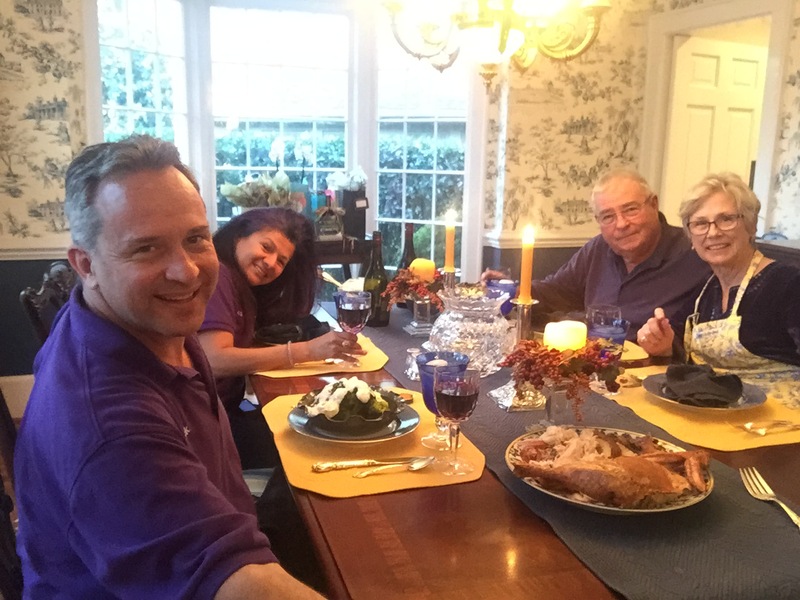 I had volunteered to do the turkey, having a few years of experience with doing so from Rosemarie and I hosting Thanksgiving for much of the last decade at our Miami Beach condo. I follow an Alton Brown recipe learned from NPR years ago, which starts with at least a 24 hour full submersion in a cold brine made of salt, brown sugar, and spices. A few hours before meal time I remove it from the brine and work melted butter mixed with herbs between the meat and the skin of the breasts and thighs. Then we cut out the backbone, turn it over, break the breast bone, and splay it out on a large pan. 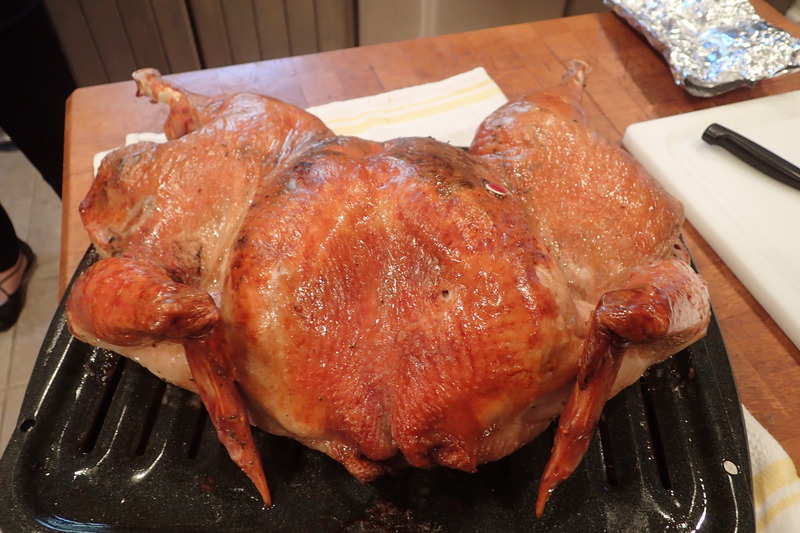 This process is called spatchcocking, and it cuts the cook time in half since you have a much larger surface area, and generally solves the problem of cooking the dark and light meats evenly. Into the oven for somewhere between 80 and 120 minutes, starting at high heat for 20 or so then dropping to medium for the rest. Add to the turkey the mashed potatoes, fresh cranberry sauce, stuffing, broccoli, gravy, and it was quite the feast. We hope to repeat the joy of such evens many times in the coming years of travel. 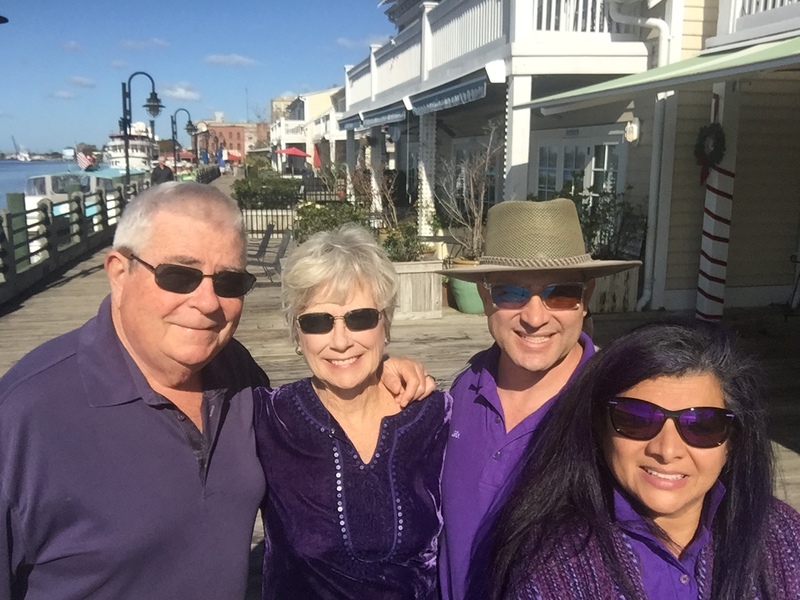 The Purple Contingent out on the Wilmington Riverwalk.